Recording Beautiful Things memories. Best Practise. Although the last couple of gloomy days mean really dark or bizarrely flashlit photographs I’m quite enjoying the foggy grey days. Ida and I spend our afternoons very happily either side of the table. 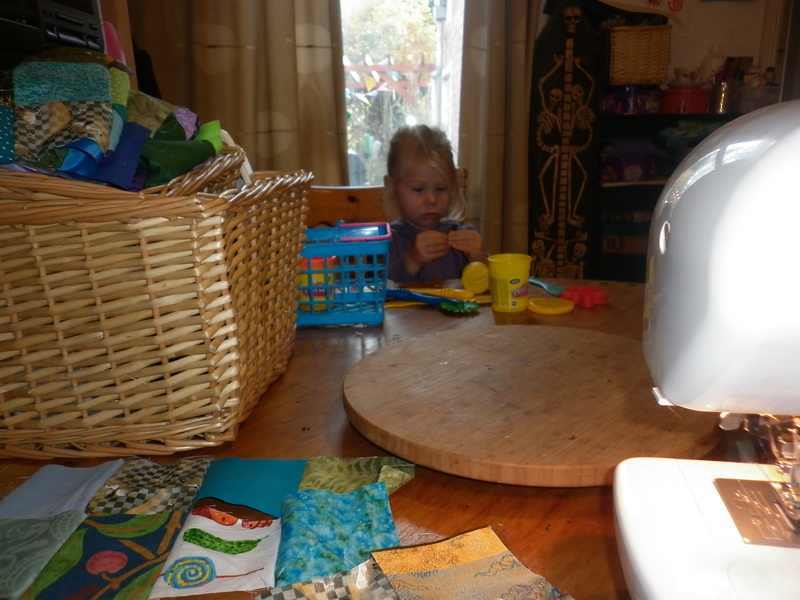 I have my sewing machine or a glue gun and she has play dough or a paintbox. Occasionally we go around to the other’s side to look in admiration or help sort out a thorny problem like biscuits stuck to the table or how all the paintblocks have turned brown. It’s actually very good for my self-esteem – oh noes – problems solved in the blink of an eye. It amazes me how long she can concentrate on something that interests her. I think she has better focus than me. We both get lots of happy satisfaction from this time. The cushion mountain is also growing..
Today I’m determined to achieve a little so unrotated photo it is! 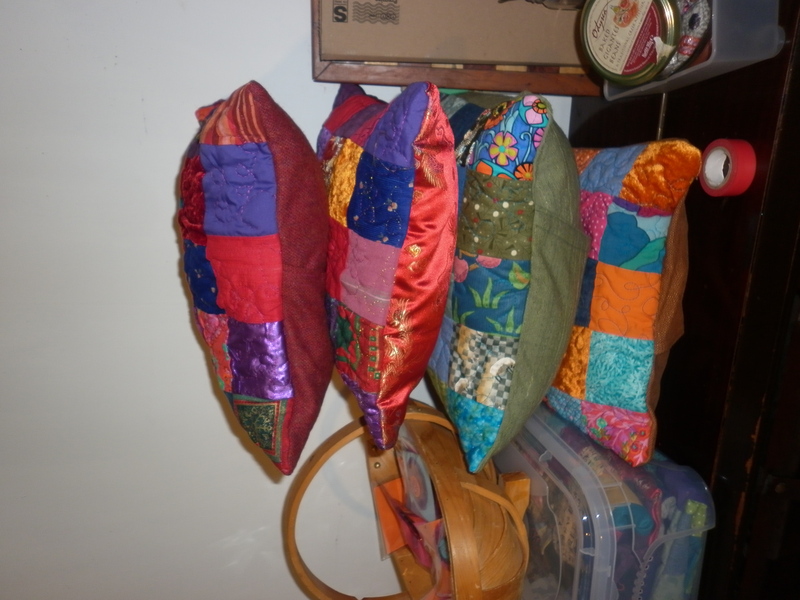 The cushion pile has doubled since then and I now have several markets lined up. I alternate between gloomful surety I won’t sell a thing and will have wasted the meagre amount of cash I have invested and deep sweat inducing fear that I have not made enough stuff which jerks me out of bed in the morning for an hour at the sewing machine before everyone else gets up. 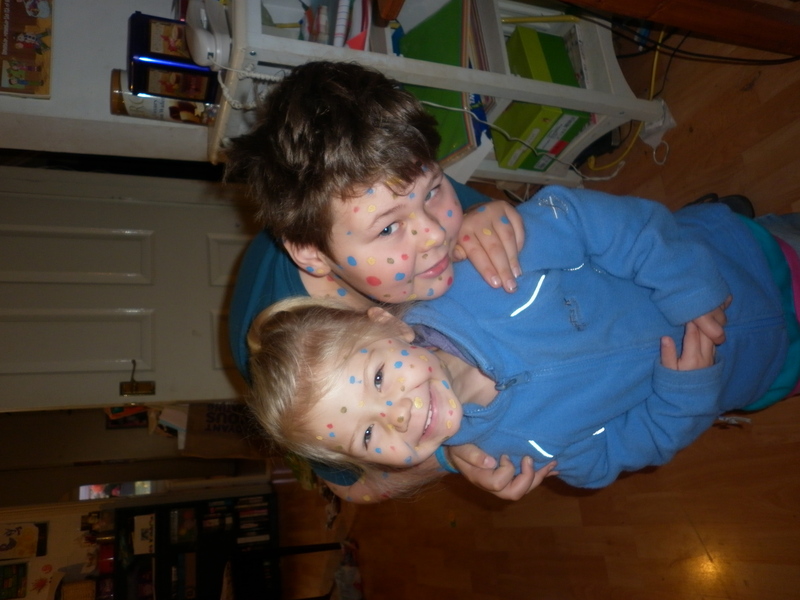 Zeph and Ida are deeply interested in everything I produce. Zeph admires the cushions and offers up interesting plans for future makes. He seemed incredulous at first when people wanted to buy the wings but now seems pleased and proud of them. A lovely woman came to pick some up she’d ordered through my fb page yesterday and he jigged about afterwards saying incredulously – “a stranger!” I could easily be slightly offended by this but I feel exactly the same so join in the jigging and finger the notes she paid as though they might turn back into oak leaves and flutter away. Despite feeling under pressure the sense of achievement and boosted self-esteem is well worth it. With happy eyes BT’s are everywhere. Yes, yes – also unrotated… I am adding ‘update browser’ to the to-do list. We had pea and ham soup for tea last night and there’s enough left for Ida and I to have for lunch. A small pleasures but a very greedy/happy one. My mum bought Ida a new dress last week. It’s a scandi looking knitted tunic dress and brings both of us much pleasure. It suits my little blonde imp very well and every time my eye falls across it I feel happy and warmed by the love behind the gift as well as how beautiful she looks. I’m also enjoying marvelling at her new scissor skills. She can spend a joyful hour snipping shapes out of paper. Not so thrilled about the multitude of tiny paper pieces that join the threads on my floor to be tracked all over the house but on balance it’s a price well worth paying! but now they’re full of sorted assorted material, wools, wadding and ribbon. Stacked up they are a hugely Beautiful Thing. Today the gorgeous low sun slants in through the steamed up windows and makes the room glimmer. I can bear struggling up out of my bed in the dark mornings when the walk to school is full of these bouncing electric sunrays. They make me thrum with happiness and skip with Ida through the puddles past our beloved bird’s-nest. She has dug out a leopard glove puppet from the toy box and as I sit here typing half an eye on the tottering stack of wings that need sewing I can hear her chuntering about chatting to him on her hand which I find very BT. I try to fix it in my mind for forever and have a sudden mental picture of all these fluttery fleeting fragments stretched out like pinned butterflies on my mental corridor. I’m going to choose to change that to a huge Victorian style conservatory, like the ones in Kew, filled with dancing live butterflies. As you walk through the clouds they kiss your upturned face with their impossibly delicately feathered wings and you get a tinglely jolt of the memory they hold. 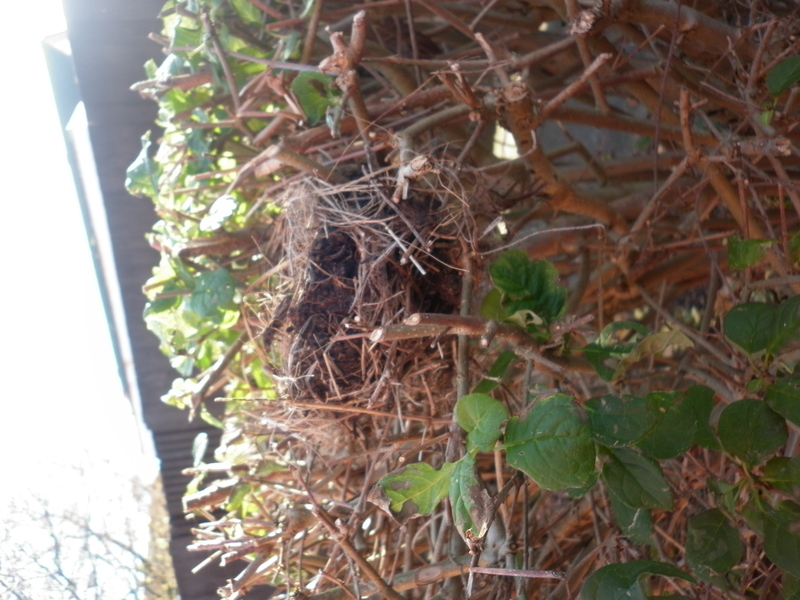 This entry was posted in Uncategorized and tagged angel wings, autumn, Beautiful Things, children, craft fairs, happiness, parenting, patchwork, sewing, thinking. Bookmark the permalink. The pillows look lovely and cheerful — as do the children. 🙂 Thank you very much – and for your lovely encouraging comment the other day. Wings are literally flying out *ha* and it’s very satisfying. I love vivid colours but I’m also very fond of muted ones, I found a beautiful sheeny dovegray scarf today and feel all zingy about making something with it. I love the cushions! How much? I am serious about buying some of your stuff and you have my contact details.